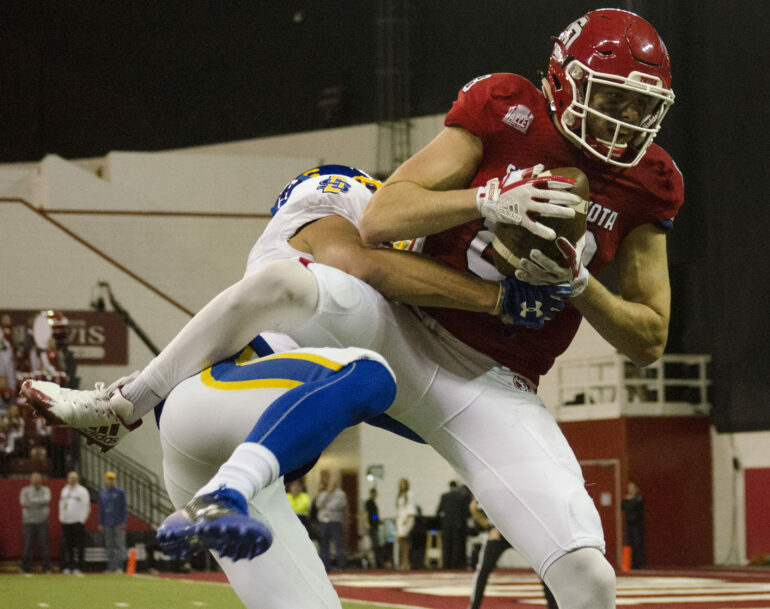 With back and forth plays, and scores fluctuating for three quarters, the Coyotes couldn’t keep up with the South Dakota State University Jackrabbits, and lost 31-28. Despite the loss, there were a few highlights for USD. The game honored the 17 seniors on the team before kick off. Senior quarterback Chris Streveler broke USD’s record for passes in a single season, a record previously held by Wesley Beschorner in 2005, according to GoYotes. Sophomore Dakarai Allen and junior Michael Fredrick scored twice in the game. Allen scored the final touchdown for the Coyotes with 2:14 remaining in the fourth period, bringing the Jackrabbits’ previous 10-point lead to a 3-point one. Allen led the Coyotes in yards with 83, followed by senior Brandt Van Roekel with 68 and freshman Kai Henry with 50. SDSU had multiple injuries on the field, one resulting in USD junior Alex Gray getting disqualified for targeting. Head coach Bob Nielson said he was “really proud” of the team today at a press conference. An emotional Nielson said Streveler hadn’t practiced all week due to a hand injury. This game, being the Coyotes’ last, will determine whether they qualify for playoffs for the Missouri Valley Football Conference or not. There were a few drives and plays the team didn’t capitalize on, Streveler said. “It comes down to execution,” he said. Armstead said the team pushed back in the second half. The Coyotes are 7-4 in the season.